Next monday is the fifth of November and, thanks to Maria, I remembered that it is Guy Fawkes' day!! Have you ever wondered where do the Anonymous masks come from?? There is an astonishing Comic called "V for Vendetta" which inspired a not less impressive movie 6 years ago. I strongly recommend both of them to you, they're worthy your time! Finally, I do not want to compete with Ivan or Sergio's blog, but I'm afraid this piece of news is more hilarious than anything they have uplaoded so far! XDDDD Haahhaha!! !OMG!! And this man is postulating himself for President of the United States! I almost forgot to publish your new challenge!! XD Euler Piruleta services are required again!! Nevertheless, now Euler Piruleta has to face a new situation… Due to the American Elections taking place this weekend, V from “V of Vendetta” is planning to demolish Navarro Villoslada High School. You may think that this is some good news, but the truth is that his plans affect you all since his idea is to set a bomb someday next week between 9 AM and 2 PM. To deactivate the rudimentary bomb’s mechanism you should practice with these two hourglasses to learn who to measure exact periods or time. C’mon!!! You are our only hope!! 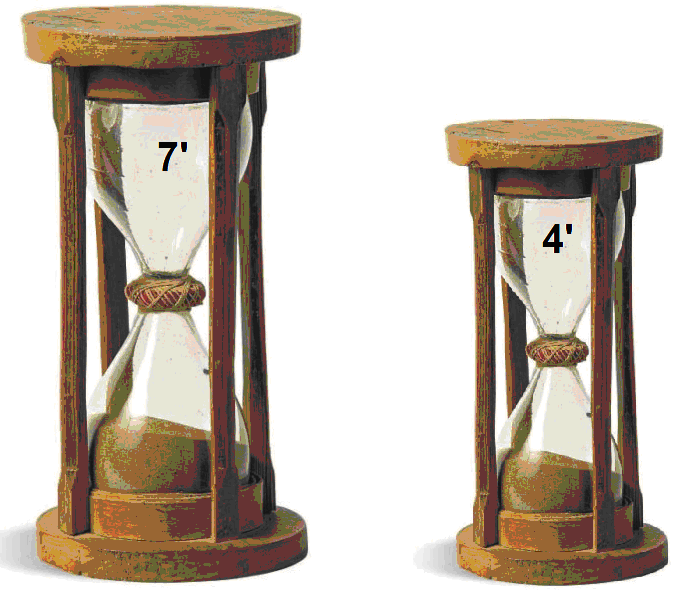 These two hourglasses last for 7 minutes (the big one) and 4 minutes. 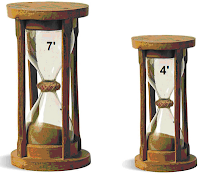 How can we measure exactly 9 minutes (nor one second longer, neither shorter) using those hourglasses? Tip: try to start both hourglasses at the same time. What happens after exactly 4 minutes? Deadline: Saturday the 10th of November! I think I've done it, I send you the answer! I'm writing on behalf of Euler Piruleta. He has asked me to thank you all for the help you have provided ;) I reckon he will require your services in a few days... Evil will strike back!!! !